In 1972 the company were recorded as having 46 staff but closed shortly thereafter. Thanks also to Ron Hilborne for telling me that WH Bicknell was the Band Master of the Salvation Army band and identifying him in the photograph below. Photographed on 19 July 1919, designated 'Peace Day' throughout Britain and the Empire, Yeovil's thanksgiving service was held in Wyndham Fields. 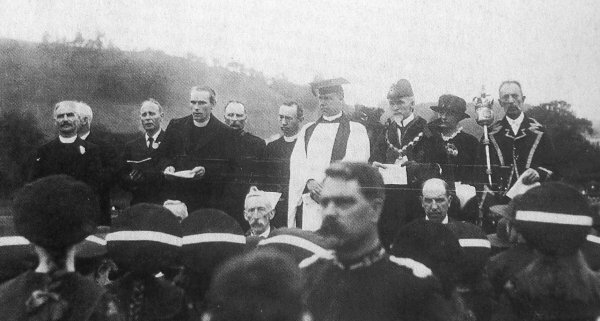 At centre, in his canonicals, is Rev Herbert Cecil Sydenham, the Vicar of Yeovil, next to him in mayoral regalia is mayor William RE Mitchelmore, dubbed the 'Peace Mayor', and at far right is Mace Bearer Henry Jesty. In the foreground, facing the camera, is Salvation Army Band Master WH Bicknell (thanks to Ron Hilborne for identifying him).